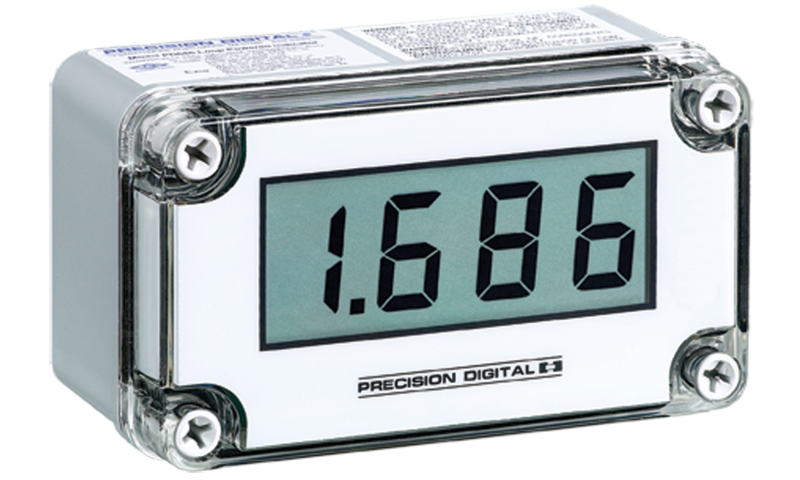 The PD686 is an FM Approved, CSA Certified intrinsically safe and nonincendive, NEMA 4X, IP67 loop-powered indicator that is easy to install and program. It can be seen from considerable distance and even in bright sunlight. The fact that this meter is loop-powered means that there is no need to run additional, costly power lines into a hazardous area. The meter gets all of the power it needs from the 4-20 mA loop and its 1 V drop results in a minimal burden on the loop. The meter features a wide -40 to +85°C operating temperature range and is available with a ½" conduit hole in a location of your choice for easy installation. Calibration is a quick two-step process involving the adjustment of only high and low, non-interacting potentiometers. Remove the printed circuit board from the enclosure. Connect appropriate size conduit fittings to the hole provided. For enclosures without a pre-drilled hole, the installer must make a hole in accordance with the instructions for the particular conduit fitting being installed. Connect conduit (with attached hubs) to the enclosure. Conduit hubs must be connected to the conduit prior to being connected to the enclosure. Use only conduit hubs that are designed to maintain NEMA 4X or IP67 ratings. Note: Please read FM Approved & CSA Certified Loop-Powered Meter Intrinsic Safety Barrier Connections (LIM686-2, Dwg No 1155) – for more information pertaining to the conduit holes. Remove the enclosure cover from the base. Insert mounting hardware into mounting holes in enclosure base. Secure the enclosure base to the mounting surface using the inserted hardware. Re-attach the enclosure cover to the base. The only tools needed for calibration are a calibrated current source and a small slotted / flathead screwdriver. To access the input terminals it is necessary to remove the enclosure cover and the Display PCB. This is done by loosening the four screws on the enclosure cover and removing the cover. Completely loosen the left screw that holds the Display PCB to the enclosure and loosen the right screw about four turns so the Display PCB remains attached to the enclosure. Rotate the Display PCB 90° to gain access to the Input Signal PCB. Next, connect a calibrated current source. The decimal point jumper array is located in the lower right corner of the Display PCB next to the display. It is labeled DP1, DP2, DP3. Place a jumper over both pins of DP1 for a display of 199.9, DP2 for 19.99, or DP3 for 1.999. LO and HI calibration controls are located to the left of the display. Apply a signal equal to 4 mA and adjust the LO control to display the desired reading. Apply a signal between 16 and 20 mA and adjust the HI control to display the desired reading. 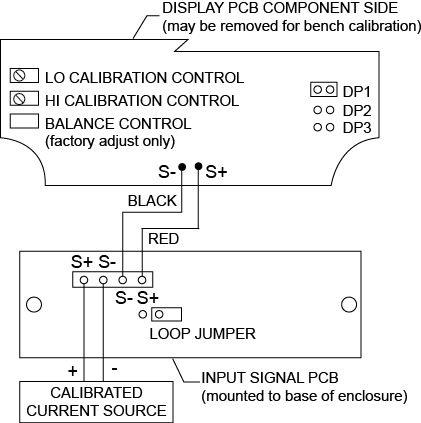 Complete the calibration procedure by making any minor adjustments to the LO and HI controls. Installation of the meter involves removing the Display PCB from its enclosure and connecting a ½" conduit fitting to the hole provided. Refer to PD686 FM Approved & CSA Certified Loop-Powered Meter Intrinsic Safety Barrier Connections diagrams (LIM686-2, Dwg No 1155) for further details. Wall mounting holes are located in each corner of the enclosure. Disconnect power to the loop and install the meter as illustrated in Figure 2 and the PD686 FM Approved & CSA Certified LoopPowered Meter Intrinsic Safety Barrier Connections diagrams (LIM686-2, Dwg No 1155) supplied with the instrument. Replace the enclosure cover. The Display PCB and Input Signal PCB are connected together with one black and one red wire. The wires are soldered to the Display PCB and connected to a screw terminal connector on the Input Signal PCB. Loosen the four screws on the enclosure cover and remove the cover from the enclosure base. Completely loosen the left-side screw holding the Display PCB to the enclosure and loosen the right-side screw four turns so the Display PCB remains secure to the enclosure. Rotate the Display PCB 90° to gain access to the Input Signal PCB. 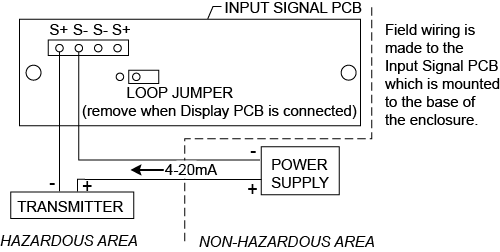 Install Loop Jumper over both pins to bypass Display PCB and allow the signal to flow through the Loop Jumper. The display turns off when jumper is installed. Disconnect the black and red signal wires from the screw terminal connector. Loosen completely the right-side screw and lift Display PCB from enclosure. Care should be taken to prevent static electricity from damaging the electronic circuitry. Restore enclosure cover to the base to prevent contamination of components. Remove enclosure cover as described above in step 1. Secure Display PCB to enclosure using right-side screw; do not tighten screw to allow rotation of Display PCB while accessing Input Signal PCB. Connect red wire to S+ terminal and black wire to S- terminal. 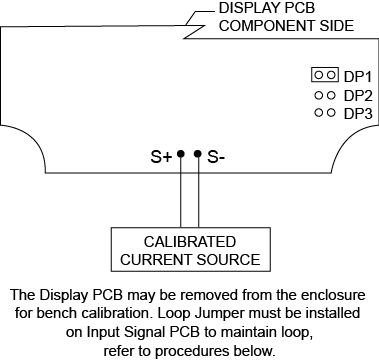 Remove Loop Jumper to allow the signal to flow through Display PCB (save push-on jumper by placing over one pin only). Tighten screws holding Display PCB and install enclosure cover. Two modes of input signal allow the user to remove the Display PCB for service without interrupting the loop as indicated above and operate the Display PCB at another location in a nonhazardous area. The loop remains connected to the Input Signal PCB while the Display PCB is absent for service. The user may operate the Display PCB at another location by connecting a signal to "S+" and "S-" wires on the Display PCB. Approvals: FM Approved & CSA Certified as intrinsically safe with entity, for use in Class I, II, III, Division 1, Groups A, B, C, D, E, F, & G; T-code = T4; hazardous locations. 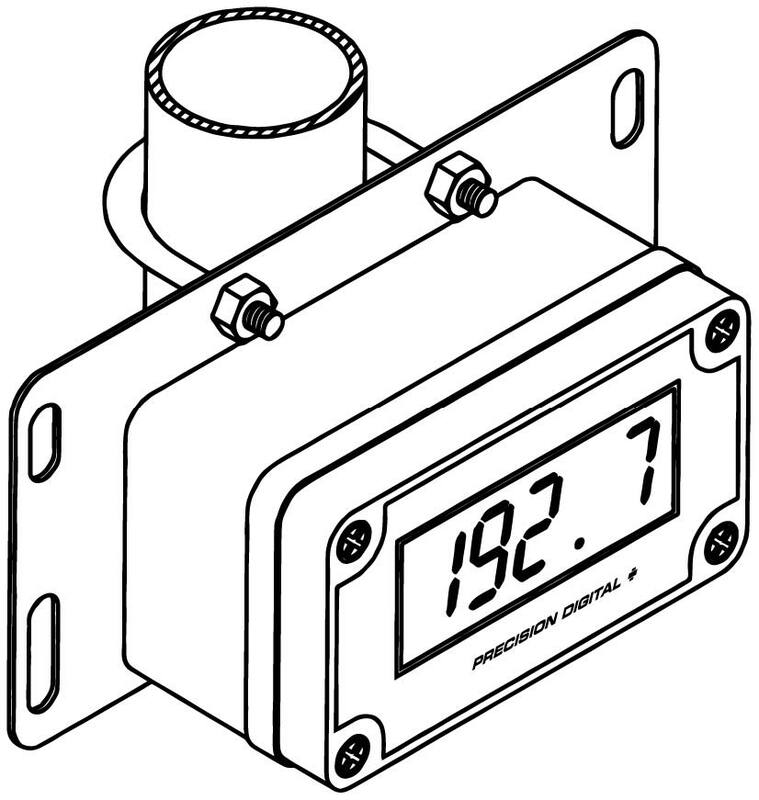 Non-incendive for use in Class I, II, III, Division 2, Groups A, B, C, D, F, & G.
See Control Drawing LIM686-2 for complete installation instructions. for Canadian installations -40 to 40°C. Conduit Hole: One ½" conduit hole provided; refer to Ordering Information to specify conduit hole location; request models with rear conduit hole (-X) for panel mounting applications. The PDA6845 is a pipe mounting kit with two mounting holes. It provides all of the necessary hardware to mount the PD686 to a 2" pipe. It is available in zinc plated and stainless steel materials. The PDA6844 is a panel mounting kit for the PD686. It provides all of the necessary hardware to mount the PD686 meter to an equipment panel. 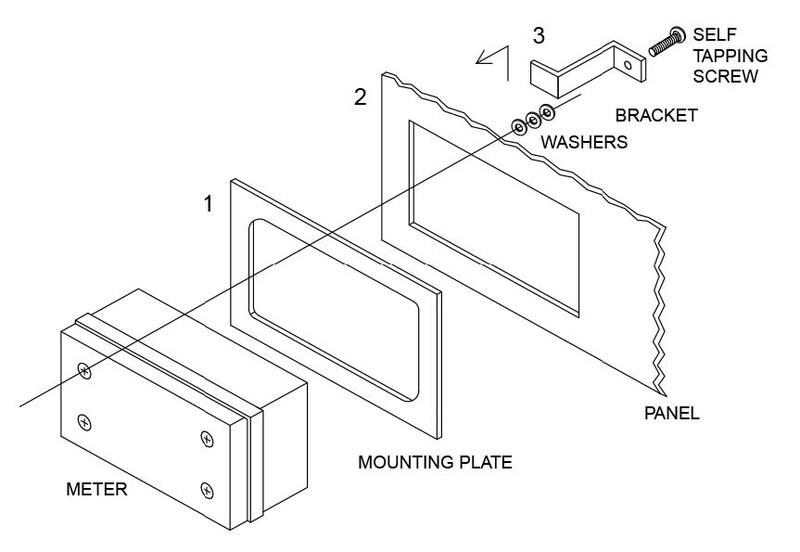 This panel mounting kit is not intended to provide waterproof protection to the panel.